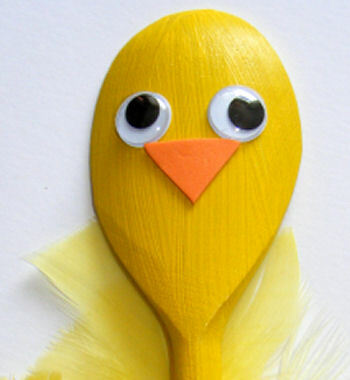 Our Chick Wooden Spoon Puppet is a quick and easy Easter or farm theme craft - and not only fun to make but fun to play with too! Kids might like to make our Bunny Wooden Spoon Puppet too. Kids will have fun making this wooden spoon puppet chick - and playing with it too! Paint the spoon yellow and leave to dry. Cut a beak from orange foam and glue to the back of the spoon. Stick on the two wiggle eyes. Glue the feathers along the handle.